As per Hinduism, the life on earth is not a discrete one time event. It is just one episode in the play. There would be multiple appearances (births) before the soul finally takes leave from the cycle. The birth is not just limited to being born as human, it includes the births as the animals, plants, even as the divines who rule the parts of nature ! After-all, all these things have a life. The appearance of the soul in any of such forms is called reincarnation. After so many births when the soul is freed of any more reincarnation, it is in the state of mukti or liberation. This is the ultimate state. This karma is further categorized. In the example let us assume the person on moving to the new place gets a new local account into which initially some of the credits and liabilities from the global account get transferred to start with. Subsequently till the person is in that location the day to day transactions occur onto that local account. Similarly from the global account of karma, which is known as prarabdham, some portion is transferred to the new local account when the soul reincarnates into a new body and this portion of karma is called sanchitham. In the day to day affairs the soul enjoys the fruits of the good deeds from the karma bank and suffers the fruits of bad deeds. In the process due to the deeds it performs the soul accumulates new good and bad karma to add to its account. This newly earned karma is called AkAmiyam. When the soul leaves that body the balance gets transferred back into the global account. The journey goes on. In the life we see in this world, we work to get the results. The work is the action and the result is fruit of it. This is exactly what is karma. The reincarnation (in conjunction with karma) explains why some people never gets to see the fruits of their action in their life time and why some children die when they have committed no sin. When the karma exist one would have to undergo the fruits of it for which one may have to go through multiple births in multiple forms - plants, animals... The bank doesn’t let you go unless the account is settled ! Saint Manickavasagar’s real name was Vadhavoorar as he was born in a place called Thiruvadhavoor. When he sang songs in praise of God Siva, God Himself complimented his compositions and named his words as ‘gems.’ Hence he came to be known as Manicka (gem) Vasagar (words) - one whose words uttered are like gems is the meaning of the name. The Saint found bliss in the thoughts of the God Supreme and was fully immersed in the absolute bliss of his God. He wanted nothing else. Each of his songs “Thiruvasagam” proves it. In one of his songs in the “Thiruchathakam he says - “I do not want the friendship of status of the Devas like, Indran, I will only seek the company of your duo less on Lord with them I will stay even in hell.” He sought the company of the spiritually enhanced devotees. “Do one does not melt for Thiruvasagam, one will not melt for anything else.” If the songs are rendered with feelings, tears will flow hours the face of anyone listening. In the 19th stanza of the Thiruchathakam, he says. How can I praise and hail Him, who is the sky and the earth, the wind and the light, the flesh and the life, who is the Truth and not, the king and who sways those who are egoistic proclaiming ‘I’ and ‘mine’ - How oli in what ways can I praise Him. His most touching stanza also comes from the chapter Thiruchathakam where he asks God Siva. “You gave yourself to me and took me unto you. He asks His attachment to the God Supreme is such, he challenges Him so - In simple words. “I got you O Lord. When he hears the melodious calling of the cuckoo, he addresses the bid thus. Anything and everything reminds Him of the Almighty God Siva should he see young girls going out early in the morning for a river bath, he imagines himself as a maiden and taps on the doors to awaken the young maidens in his imaginations to get up and baths int he river and go to the temple where dowels God Siva should he see a dragon fly, he addresses the insect requesting it to sing the praise of his Lord. Singing the glory of God Siva is the ending of each stanza. “He who is more ancient than the ancient. He who would remain when all else in the cosmos is destroyed. He who has given His left side to umayal, He who is worshipped in the south in the Pandyakingdom. He who blesses those who hail Him as the faiths - Let’s play ammaned praising Him thus. If he meditates, the Saint thinks only of Lord Siva. Such was his devotion to God Siva that his mind, intellect thought, were all concentrated on that one supreme entity. It made him so happy that he would talk to himself laugh, clap his hands and rejoice, and sometimes over whelmed with emotion, shed bears. He was regarded as a mad man. But even though he heard there comments he understood them not. Because as a spiritually enhanced individual he had no ego - no sense of ‘I’ or “mine” - He had totally surrendered himself to the Supreme God Siva. Nothing else mattered from head to toe he belonged to his dear Lord. Such is the nature of all realised saiva and vaishnava saints. She was a deeply religious woman and her activities proceeded from religion and her motto was “Service to man was service to god.” She was a courageous woman of faith and transformed her thoughts and intentions into action, passion into reality and every minute with valuable moments. Indeed, one of her courageous achievements was the establishment of Durgapura Makalir Illam (Durgapura Girls Home) in 1982. As President and Trustee of Tellipalai Sri Durga Devi Devasthanam and a woman who was in charge of Durgapura Makalir Illam for more than 25 years, she discharged her responsibilities with unsurpassed distinction. The secret of Dr. Thangammah Appakutti’s success in all her endeavours was purely an account of her dedication, devotion, high sense of discipline, total commitment combined with her deep religious outlook in life, exemplary character and versatility of her intellect. Indeed, no field of human endeavours was left untouched by the amplitude of her imagination, encompassing sweep of her thought and felicity of her words. 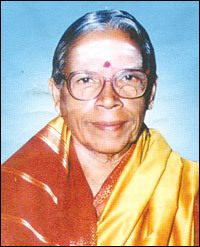 Dr. Thangammah Appakutti was born into an orthodox and conservative family in 1925 and received her primary education at Mallakam Visalatchi Vidyalayam and thereafter she entered Ramanathan Teachers’ Training college and became a Trained Teacher and started her teaching career at St. Ciciliya school in Maddakalappu (Batticaloa). Besides, teaching, she was very much involved in religious activities and became a very good speaker pertaining to religious matters. Blessed with a dialectical skill and a sharp logician mind, an oratorical ebullience combined with fearless and courageous mind she was able to accomplish and achieve her objectives and build round her a massive followers who subscribed to the principles she extolled. She had the rare opportunity of delivering a speech at Annamalai University where the audience were greatly marvelled by her dynamic religious speech. Realizing her tremendous contribution to Hindu Religion, social service in Sri Lanka and abroad she was conferred with the Title of “Chen Chot Chemmani” by Madwai Atheenam in 1966. She was conferred with the title of “Sivagna Vithagar” by the All Ceylon Hindu Congress. Further, she was also honoured and felicitated by the University of Jaffna. She was even invited by several religious organizations and temples in Malaysia, Singapore and several other countries to deliver religious speeches and discourses. Indeed, Dr. Thangammah Appakutti dedicated her life in the service of humanity and the whole of Sri Lanka was her home and all human beings were her brothers and sisters. Naga Pooshani Ambal Temple at Nainativu is an ancient and historical temple which is situated four square miles, off the Jaffna peninsula. Nainatiu had enjoyed a foremost place in Sri Lanka’s history having been the seat of Naga Kingdom. Having several names like “Nagathivu”, “Nainathivu, Naga Theepam, Manithivu and Manipallavam, the location has been foremost in religious worship. Tradition strongly associates the island as having been visited by Kannakai and Manimekalai. Further antiquarians have established the occupation of the Northern Region by Nagas in the ancient days. Many customs, traditions and forms of worship still prevail which are attributed to them. Veneration of cobra or serpent worship has been an ancient custom. In due course, it is surmised, evolved the Hindu worship of Nagathambiran, when the Siva Linga deity is canopied by the hood of five headed cobra and Naga Pooshani Ambal worship when the Ambal Devi is similarly exalted. A foremost Sannithanam of this form of the Ambal, also known as Nagambal or Nageswari is at Nainativu. In the Eras of the revival of Hinduism, spearheaded by Srila Sri Arumuga Navalar a proper agamic temple was erected in 1882 and the Ambal Devi Vigrakam installed with the name of Naga Pooshani Amman Kovil. Regular worship ensued and several improvements were effected by various devotees. A Rajagopuram was effected in 1935. The management of the affairs of the temple came under a Trustee Board in 1949. In 1957, a magnificent chariot (THER) was constructed which is considered to be one of the best in Sri Lanka. The main entrance to the Temple and the sanctum face the east and the vast ocean with the landing pier. The pilgrims when they land in the island pay obeisance to the Ambal. The figure of a five headed Naga serpent is seen in the Sancham bearing the Ambal Devi’s Thiru Uruvam. The annual festival of this temple which lasts for 15 days is a grand affair when thousands throng this little islet to receive Ambals’ grace. On other days, all the Saiva Festivals are observed throughout the year. Daily regular poojas are performed four times. Indeed, no story of Nainativu is complete without the mention of its outstanding saintly personality “Nainati swamiyar”. Born as Muthu Kumaraswamy, he became a great saint and attained higher saintlihord, before his demise in 1949. In fact, his Samadhi is a place of veneration in this isle.